How Was the Old Testament Formed? | How Was the New Testament Formed? The Origin of the Bible | Progressive Revelation | Who Wrote the Bible? Purpose, Theme, Authority... | Main Divisions of the Bible | Why Was the Bible Written? The word "Bible" comes from the Greek bibilia meaning "books". True to its name, it is a collection of 66 books. The first part, the Old Testament, contains 39 books; the second part, the New Testament, contains 27 books. The word "Scripture", which we often use to refer to the Bible, comes from the Latin word relating to script and means "sacred writings". The Bible also does not discriminate according to race, gender, age, nationality, or class. It is a book to which each individual can relate personally. We can receive blessing, instruction and correction from reading the Bible, even though we may not understand it completely. However, the full joy of Bible knowledge comes only from serious study. The Bible story begins in Genesis with the creation of the world and humankind, and it ends in Revelation with the creation of a new Heaven and new earth. In between these two books we have the story of how God worked out man's salvation so he can enjoy eternal life with Him. Today, we have the full revelation through Christ, the living Word (cf. John 1:1). The people who lived in the Old Testament times did not have this. They only had a part of it. As time went by, God revealed more and more of His truth. We call this progressive revelation. God dealt with Old Testament people in a different way than He deals with us today. For example, the teachings in the New Testament against polygamy and divorce seem to conflict with Old Testament stories of these practices. But Jesus explained that God dealt differently in the past because the people were slow to understand (cf. Matthew 19:3-9). They had less of the truth revealed to them than we have. We have more truth because Jesus came to show us the way. Although approximately 40 men physically wrote or dictated Scripture over a period of 1500-1600 years, God is the true Author: "For no prophecy was ever produced by the will of man, but men spoke from God as they were carried along by the Holy Spirit." (2 Peter 1:21) Even God Himself wrote the Ten Commandments on tablets of stone with His finger (cf. Exodus 31:18; Deuteronomy 9:10). The Bible tells us these men were "holy men of God": they were kings and peasants, poets and merchants, military and religious leaders. They were from different backgrounds, different cities, and had different interests. The fact of how these men wrote in perfect agreement with each other is one proof they were all guided by a supernatural force: that Force being God. Some scholars today try to persuade us that, though the Bible does contain God's truth, it also contains errors. Others try to explain that parts of the Bible become the inspired Word of God to each person when God speaks to them through the particular words in the Bible. Still others explain that God dictated the Bible word-for-word to men who wrote it without thinking about the words. But these ideas, as reasonable as some might appear at first glance, don't convey the true meaning of the word "inspiration". As the Bible tells us, "inspiration", in reference to the Bible, is the actual "breathing in" of God's Spirit to guide the thoughts of the writers, not to override their own unique personalities or communication styles. If we accept any of God's Word as truth, then we must accept the whole Word as truth. Nevertheless, we cannot say the writers were mere machines with no freedom of choice. Although some did not fully understand what they wrote  especially concerning prophecies yet to be fulfilled  others studied their topics [primarily the gospel records and epistles]. They even wrote about their own experiences. What all had in common  whether writing word-for-word or personal experiences or ideas  was God's special revelation, as Paul wrote: "...how the mystery was made known to me by revelation, as I have written briefly. . . . which was not made known to the sons of men in other generations as it has now been revealed to his holy apostles and prophets by the Spirit." (Ephesians 3:3, 5) And His Holy Spirit continues to confirm God's Word as truth today! All of the writers wrote under God's inspiration the words of His message for us. The Scriptures help us to live in right relationship with God and with one another. They primarily help us, though, to understand the perfect holiness and righteousness of our God and prepare us for, and lead us to, the Messiah. Why should 66 books  written by approximately 40 men over a period of 1600 years  be put together in one book? The answer: Because one theme runs through them all. 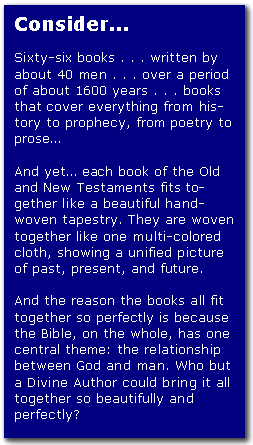 Like various threads of many colors and sizes woven into a beautiful tapestry, the individual books of the Bible, together, show us different parts of the same picture. Books of history, law, poetry, prophecy, biography and practical teaching in the Bible have one central theme: the salvation and reconciliation of sinful man by a loving God. Both the Old Testament and New Testament reveal humankind's need for a Savior and God's provision of a Savior in the Person of Jesus of Nazareth  Jesus the Christ, the Messiah. The Old Testament, which was written centuries before Jesus was born, contains hundreds of prophecies about Him. And the New Testament tells us how the Savior of mankind came into our world and how we can be saved by Him. The theme of the whole Bible  salvation for mankind  centers around Jesus, the Savior for humankind. The words of the Bible, just as the writers wrote them at first, are the best words possible to express God's purpose. Since they were inspired by God, we can trust them. They are always true. The words of God cannot fail (cf. Matthew 24:35; Mark 13:31; Luke 21:33). The Bible is complete. As the Word of God, it needs nothing else. Nothing is to be added to the Bible's words, and nothing is to be taken from them (cf. Revelation 22:18-19). Because the Bible is inspired by God, we know it is true and complete, and that it has "authority" to guide, instruct, and correct us. Just as the crowds who heard Jesus speak recognized a divine anointing (cf. Matthew 7:29), that same anointing of authority is on God's Word to us today. The word "authority" is defined as "final truth", "official statement or law", and "power to give commands". God's Word has authority in all three of these areas. It reveals the truth about God. It outlines God's plan of redemption for all people. It has power to change lives as people obey its commands. We can rely on the authority of the Bible. We can believe God's promises are real and claim them for our lives. When we accept the authority of God's Word, His joy and peace follow and we can respond in complete obedience. As we study the Word, we are in God's presence. He talks to each of us directly through the words of the Bible. Even though many writers wrote the Bible over many years, there are no contradictions. One writer does not contradict any of the others, even though the Bible includes discussions of hundreds of controversial subjects [a controversial subject is one that creates different opinions when mentioned]. Yet, the writers of the Bible spoke on controversial subjects with complete harmony from the first book of Genesis through the last book of Revelation. This was possible because there was only one Author: God. The writers only recorded the message under His direction and inspiration. For this reason, the content of the Bible is united. The Old and New Testaments both tell the story of Jesus. The Old Testament prepares us for Jesus' coming and the plan of redemption, and the New Testament tells how it happened. This unites both testaments in one major theme. The people who looked forward to the Messiah under the Old Testament were saved from their sins through faith in God's promise. Everyone who looks back to Christ's redemptive work is saved in the same way  through faith that it happened just as God promised. They all worshiped one God  called Jehovah or Yahweh  Creator of the universe. God revealed Himself to each of them in different ways so they could be carriers of His messages for mankind. They all wrote what God told them or put on their hearts to write  records of the past, predictions of future events, and revelations of His supremacy, righteousness and justice, but also His messages of love, mercy, grace, and forgiveness. When we speak of the "diversity" of the Bible we mean that the Bible has variety. It records different ways in which God dealt with people and the different ways in which they responded to Him. The Bible is written in different moods. Some portions express joy while others reflect sorrow. The Bible includes different types of writing. It contains history, poetry, prophecy, letters, adventure, parables, miracles, and love stories. As a result of this variety, the Bible has been further divided into major groups of books. The Bible is divided into two major sections called the Old Testament and the New Testament. The word "testament" comes from the Latin testamentum meaning "covenant". A covenant is a legally-binding agreement or contract. The Old Testament records God's original covenant, or agreement, with man and the ways in which He worked in them, for them, and through them to achieve His objectives. The New Testament records the new covenant made by God through His Son, Jesus Christ. Both testaments are the Word of God and we must study both in order to fully understand God's message. The terms "old" and "new" testaments are used to distinguish between God's agreement with man before ["old"] and after ["new"] the death of Jesus Christ. We do not disregard the Old Testament simply because it is called "old". The Bible is further divided into 66 books. The Old Testament has 39 books; the New Testament contains 27 books. Each book is divided into chapters and verses. Although the content of each book is the Word of God, the division into chapters and verses was done by man in order to make it easy to locate specific passages. The books of the Old Testament are divided into four major groups: Law, history, poetry, and prophecy. These books record the creation of man and the world by God and the early history of man. They tell how God raised up the nation of Israel as a people through which He could reveal Himself to the nations of the world. These books also record the laws of God. The best-known parts are the Ten Commandments (cf. Exodus 20:3-17), the greatest of all commandments (cf. Deuteronomy 6:5), and the second-greatest commandment (cf. Leviticus 19:18). After God wrote the Ten Commandments on tablets of stone with His finger, tradition teaches that He led Moses to write these first five books. These five books are also known as the Pentateuch (from the Greek pente, meaning "five") and are sometimes called "the Law of Moses" or the "Mosaic Law" (cf. Exodus 24:4, 31:18, 32:19, 34:1, 27-28). Many verses in the New Testament refer to the "Law of Moses" when teaching that the Law has been fulfilled and superseded by a greater or higher Law, that of the Person of Christ (cf. Colossians 2:14, Romans 10:4). There are 12 books of history in the Old Testament. The books of history cover a thousand-year history of God's people, Israel. Naturally, they do not tell everything that happened, but they record the major events and show the results of both following and ignoring God's law. There are five books of poetry. These books are frequently used for worship among God's people  both Israel and Christian believers. The books of prophecy in the Old Testament are divided into two groups: "Major" and "Minor" prophetic books. This does not mean the major Prophets are more important than the minor Prophets. The titles are used because the "major" prophetic books are longer books than those of the "minor" prophetic books. There are 17 books of prophecy in the Old Testament. These books consist primarily of prophetic messages from God to His people about future events. Many of the prophecies have already been fulfilled, but some remain to be fulfilled in the future. Moses is believed to be the writer of the first five books of the Bible. King David wrote most of the Psalms (from the Greek psalmus meaning "sacred songs"). Many of David's psalms were songs about his joys, sorrows, depression, anger, and needs. But David is also considered to be a prophet because he wrote about Christ (the Messiah), especially about Christ's death (Psalm 2:7, Psalm 22). Solomon wrote most of the book of Proverbs, the Song of Solomon, and Ecclesiastes. Several of the prophets wrote or dictated words directly from God (Acts 2:29-30; 2 Samuel 23:1-2). Samuel, a prophet and judge, is traditionally thought to have written 1 and 2 Samuel. However, many scholars believe these books were written hundreds of years later by an anonymous source [referred to as the deuteronomist1]. They say the books of Samuel form part of a well-integrated series now referred to as the Deuteronomic History (Joshua, Judges, 1 and 2 Samuel, 1 Kings and 2 Kings, 1 and 2 Chronicles), all of which are written in the same literary style and the same relatively modern form of Hebrew. Ezra, a prophet and scribe, is believed to have written both Ezra and Nehemiah. The main reason Nehemiah is attributed to Ezra is because in the Biblia Hebraica [Hebrew Bible], the books of Ezra and Nehemiah are combined as one book. The other prophets either wrote the words God gave them or they dictated them to a scribe. The Jews were the keepers and collectors of these Old Testament writings. All of them have been copied by trusted and devout scribes and translated by equally-devout Jewish and Christian linguistic scholars over the years and delivered to us today. The New Testament consists of 27 books believed to have been written by eight inspired men of God. [I use the phrase "believed to have been written" because no one knows for certain who wrote the book of Hebrews.] The New Testament has also been divided into four groups: Gospels, History, Letters, and Prophecy. There is one book of history in the New Testament, the book of Acts. This book tells how the Church began to fulfill Christ's commission to spread the Gospel throughout the world. There are 21 letters in the New Testament. While these letters may be "addressed" to specific people or churches, they are intended for all believers. Their purpose is to guide us and help us do what Jesus commanded. These letters are also sometimes called "epistles", which comes from the Greek epistole, meaning "letter". Jude, a Jewish carpenter and half-brother of Jesus, wrote one book (Jude). While there is much speculation and even assertion that Paul wrote the letter to the Hebrews, no one knows for sure. If Paul did in fact write it, it would be a departure from his usual way of writing in that he does not identify himself at the beginning or at the end of the book as he does in all of his other letters. Rather than speculate, we should be grateful to whomever wrote it because of its deep insight into Jewish culture and explanation of how Jesus of Nazareth perfectly fulfilled the Law's requirements. How Believable are the New Testament Writers? The Apostles were 12 common men who were chosen by the Messiah to be eyewitnesses of His majesty and authority while He was on earth (cf. Luke 6:13; Mark 3:14; 1 Corinthians 12:28; 2 Corinthians 12:12). By spending so much time with Him, they were the best witnesses to tell others about the Lord. Matthew, John, James, Jude, and Peter were Apostles in the sense that they knew Jesus intimately. The resurrected Jesus appeared to Paul in a vision and also chose Paul to be an Apostle (cf. Romans 1:1; 1 and 2 Corinthians 1:1; Galatians 1:1). Even though Paul only saw Jesus in a vision (cf. Acts 9:1-7), Jesus used him mightily to spread the Gospel, especially among the Gentiles [non-Jews]. Mark (Acts 12:25), also called John [not John the apostle]. Luke, when writing the book of Acts, sometimes used the word "we" to indicate that he was with Paul on some of his evangelistic journeys (cf. Acts 16:10, 27:2, 37). Both Mark and Luke would have understood first-hand from the Apostle Paul what the new message was all about. Jesus had at least two half-brothers, James and Jude, who eventually became followers of Him (cf. Mark 6:3; Acts 1:14; Galatians 1:19). Surely, they would be credible witnesses. In A.D. 397, the Church Council of Carthage met in North Africa and gave their formal acceptance of the 27 books in the New Testament, as these books and letters were already being used by the churches as the standard of Christian faith. Why Are Other Books Not in the Bible? There are three reasons why other books are not included in the Bible. The Council of Carthage considered many other books for inclusion, but rejected them because they are not considered to be inspired by God. For example, several books appeared between the period of both the Old and New Testaments. These have been grouped into what's called the "Apocrypha" [from Greek apokrupto meaning "to hide away"] and were not commonly used by God's Covenant people, Israel. The Apocrypha has been widely disputed as to whether it is inspired or not. The Catholic Bible includes some of these books as part of their Old Testament. But most other Bibles do not, including strictly Jewish Old Testaments. The final message has already been given to us once and for all in the first century A.D. (cf. Jude 1:3). The Bible was written to demonstrate or teach us about the perfect holiness and righteousness of our God and to prepare us for, and lead us to, the Messiah. The Old Testament was written as a temporary "instructor" to prepare, train, and lead the Jews to receive their Messiah. In order to come into a right relationship and be at peace with God, God now requires that we put our faith in the Messiah [the Christ], not the former temporary instructor [the Law]. The New Testament was written to prove, with both eyewitness testimony and prophetic proof, the good news that Jesus of Nazareth is the Messiah. In Bible times, the priest would pour oil on the kings' heads to anoint them as kings (Saul in 1 Samuel 9:16, 15:1; David in 1 Samuel 16:12-13; Solomon in 1 Kings 1:33-34). However, prophecy said the Messiah would be different from those earthly kings. He would be God's Son, and He would be called "Immanuel" (cf. Isaiah 7:14), which literally means "with us God" ["Immanu"="with us", "El"="God"]. His kingdom would extend from one generation to the next (cf. Isaiah 9:6, 7). He would have greater authority, not just over the Jews, but over all of mankind (cf. Isaiah 49:6). Incidentally, this was the charge against Jesus (cf. Matthew 27:37; John 19:18-22) and the very reason He was put to death  that He was, or claimed to be, Israel's Messiah, the King  which Pilate had written on His cross in Hebrew "Mashiach", in Latin and in Greek "Christ"]. When speaking of the same Person, the Bible uses both the word "Messiah" [Hebrew] and "Christ" [Greek]. Some Bibles use these names interchangeably even within the same chapter, or they note "Messiah" means "Christ". "Messiah" Also Means "Son of God"
It is clearly evident, then, that the Christ is God's Son, the King, and Messiah. This fits perfectly with what Isaiah had said, that the Ruler, the King, would be "a son" (cf. Isaiah 7:14, 9:6). He is God's Son, and therefore, if God's Son, then Deity. The New Testament confirms the Old Testament Messianic prophecies that Jesus' death for our sins, His burial, and His resurrection are the Gospel, the "Good News". So the Gospel is mainly all about the prophetic death, burial, and resurrection of the Messiah and what it should mean to us in regards to our salvation vs. condemnation. The Old Testament, especially the Mosaic Law, was written to prepare the Jews for and lead them to their Messiah. The New Testament proves that Jesus is the Messiah. The Bible leads all mankind to Jesus Christ  whether Jew or Gentile, young or old, male or female, sick or healthy, rich or poor. For the most part, there are no surviving original manuscripts of ancient books like the Bible. What we have in varying quantities of all ancient books (not just the Bible) are ancient copies of the originals. Why Do We Have Copies and Not Originals? Most likely, the scribes copied the originals  and later on copied copies of the copies  because the material on which they were written deteriorated [fell apart] so easily. One thing we know for sure is that the Gospel message contained within those ancient scrolls is more important than the technicalities of how we actually got copies of them. This verse teaches that a person can learn to trust God by hearing about the Messiah, not by studying historical evidences or lack thereof. Faith comes by hearing, not by seeing. After reading the Bible for yourself, then by faith you may begin to trust that the Bible is from God. It is the message in it that convicts and convinces people the Bible is true and reliable. Belief in the Son of God does not come by any other means than by hearing  with your heart  the message of Him. Compare the Bible to any other ancient book and you will soon see that the Bible is the best-supported by ancient copies and the best-preserved textually. The Septuagint is a Greek copy of the Old Testament dating back to 250 B.C. The Codex Sinaiticus3 is a Greek copy of both the Old and New Testaments dating from about 400 A.D. Even some fragments of New Testament books exist dating a little beyond 100 A.D. Those fragments are just a generation away from when the New Testament letters and books were written for the first time. Nothing has stirred more interest and excitement than the Dead Sea Scrolls, which were discovered in 1947 near the Dead Sea in the Middle East. More than one-third of these scrolls are books of the Old Testament that were hidden for more than 2,000 years. In fact, they are considered to be at least 1,000 years older than the Hebrew copies that the Jews used to translate from. One of the best-preserved scrolls is the Old Testament book of Isaiah. It is estimated to have been written around 200 B.C. and agrees in almost every respect with other traditional Hebrew texts, like the ones used in translating the King James Version. The Isaiah scrolls proved to be more than 95% word-for-word identical with the standard Hebrew Bible. The 5% variation consists chiefly of obvious slips of the pen and variations in spelling. So this proves, by 1000 years or more, that the copy-making process was very reliable. Because the Dead Sea Scroll of the book of Isaiah almost entirely matches other more-current copies, we have much more confidence in the copy-making process used by scribes over the centuries. These scrolls are an ancient testimony to the accuracy of today's Bibles. Perhaps you're wondering, what difference it makes if the ancient scrolls and codices [plural of codex] are accurate or not. The answer is simple: These ancient writings testify about, and point us to, Jesus of Nazareth as the Christ, the Messiah. It is necessary to prove the witness to be accurate and reliable before we can go on to prove Jesus is the Lord's Messiah. This lesson identifies the original languages in which the Bible was written and explains how the Scriptures have been translated into other languages. You will learn the difference between a translation and a paraphrase version of the Bible. I have provided various examples from various versions of the Bible. The Bible was originally written in three languages. Most of the Old Testament was written in Hebrew except for parts of the books of Daniel and Nehemiah, which were written in Aramaic. The New Testament was written in Greek. As discussed previously, none of the original manuscripts of the Bible are now in existence. Some good manuscripts exist which are copies of the original. Translations of these copies of the original manuscripts are called "versions". From early times men saw the necessity of translating the Bible so everyone could read it in their own language. No translation is an exact word-for-word translation because no two languages are exactly the same. In fact, some words used in the Bible do not even exist in some other languages. For example, there is a tribe of Indians in Ecuador, South America, called the Auca Indians. When missionaries first contacted them, these Indians did not know how to read or write. There were no words in their language for "writing" or "book." The Auca Indians had a custom of carving identification marks on their property. Since there were no words in their language for "scriptures", "writing" or "book", when the Bible was translated into their language, it was called "God's Carving". This identified it as something belonging to God. This is just one example of the difficulties in translating the Bible into other languages. A translation is an effort to express what the Greek, Hebrew, and Aramaic words actually say. It gives as nearly as possible a literal word-for-word translation. Extra words are inserted only when it is necessary to aid the reader's understanding. Rather than translate word-for-word, a paraphrase is a restatement of the meaning of a passage. It translates thought-by-thought. Paraphrase versions are easier to read and understand because they are written in modern vocabulary and grammar, but they are not an exact translation of God's Word. I have selected the text of John 3:16 to illustrate the difference among various versions of the Bible. The versions listed are the most popular English versions of the Bible. "God loved the people of this world so much that he gave his only Son, so that everyone who has faith in him will have eternal life and never really die." "For God had such love for the world that he gave his only Son, so that whoever has faith in him may not come to destruction but have eternal life." "For God so greatly loved and dearly prized the world that He [even] gave up His only begotten [unique] Son, so that whoever believes in (trusts in, clings to, relies on) Him shall not perish (come to destruction, be lost) but have eternal (everlasting) life." This is how much God loved the world: He gave his Son, his one and only Son. And this is why: so that no one need be destroyed; by believing in him, anyone can have a whole and lasting life. God didn't go to all the trouble of sending his Son merely to point an accusing finger, telling the world how bad it was. He came to help, to put the world right again. Anyone who trusts in him is acquitted; anyone who refuses to trust him has long since been under the death sentence without knowing it. And why? Because of that person's failure to believe in the one-of-a-kind Son of God when introduced to him." "For God loved the world so much that He gave His only Son, so that everyone who believes in Him should not be lost, but should have eternal life." The King James Bible is very accurate and is a good translation for serious study. A paraphrase version does not contain the exact word-by-word translation of Scriptures. There are more study tools, such as concordances, dictionaries, and commentaries written for the King James text. They have a complete listing of all the languages in which the King James version of the Bible is available. They maintain a list of "Scriptures of the World" which identifies all the languages in the world in which at least one book of the Bible has been published. Several versions of the Bible come in what are called "red-letter editions". In red letter editions, the words of Jesus are printed in red. The rest of the text of the Bible is printed in black ink. If a red-letter edition of the King James Bible is available in your language, I suggest you obtain it. 1 deuteronomistic adj. 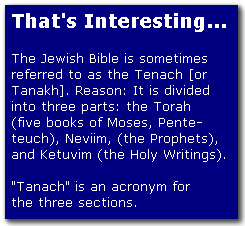 from deuteronomist (n.), one of the four sources of the Torah assumed by an unproven Documentary hypothesis that holds that the Pentateuch (the Torah, or the Five Books of Moses) was derived from originally independent, parallel and complete narratives, which were subsequently combined into the current form by a series of editors. In the Torah, this source is restricted to the book of Deuteronomy, but similar themes and language are found throughout the Biblical books of Deuteronomy, Joshua, Judges, Samuel, and Kings. This series of books is known among Biblical scholarship as the "deuteronomistic history". 2 Aramaic n. - a language used by the Semites, a people descended from Noah's son, . 3 Codex Sinaiticus n.  1 "codex" is an ancient unbound manuscript in book form, instead of a scroll. 2 a manuscript of the Christian Bible written in the middle of the fourth century that contains the earliest complete copy of the Christian New Testament. The hand-written text is in Greek. The New Testament appears in the original vernacular language (koine4) and the Old Testament in the version known as the Septuagint, that was adopted by early Greek-speaking Christians. 3 Koine n.  the universal common dialect of the Greek language.